This basic tutorial part 2 for beginners explains HTML web coding in an easy to understand way with the novice user at mind. 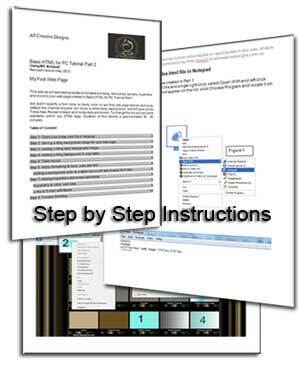 A comprehensive tutorial with step by step instructions including full color screen shots in Word or PDF format enabling you to build your own basic web page by only using the Notepad editor. This tutorial will explain how to create a full functional web page for the world wide web and does require prior knowledge of basic web editing or web coding learned in the HTML Tutorial Part 1. Find a choice of PDF or MS Word documents formats to download below. This tutorial uses full color screenshots and a comprehensible language helping you to understand the basic principles of HTML. This tutorial will add backgrounds to the table and body we created in the basic html tutorial part 1. We didn’t specify a font color, font type or body color in our first web page and so by default the internet browser will show a white body background, the font type will be black Times New Roman and no borders are shown. To change this we will add extra elements within our HTML tags. This tutorial will also add hyperlinks and include your e-mail links on your web page. HTML is the primary language used to create pages on the World Wide Web. Duration of this tutorial is approximately 40 - 50 minutes and will enable you to build on the basic web page we built in part 1. If you can create a folder, save files and are able to copy and paste this tutorial is not difficult to complete. Educational institutions can contact us to print this PDF for study purposes only. Expand the Tutorials Menu to access other Web Design and Image Edtiting Tutorials.